PADI Rebreather Instructors teach the PADI Rebreather Diver and PADI Advanced Rebreather Diver Courses on the specific unit they qualify on. a. Qualify as a PADI Advanced Rebreather Diver or equivalent on the specific rebreather you want to become a PADI Rebreather Instructor for. b. Log 75 rebreather dives including at least 50 dives and 50 hours on the specific rebreather you aim to become an instructor for. 2. 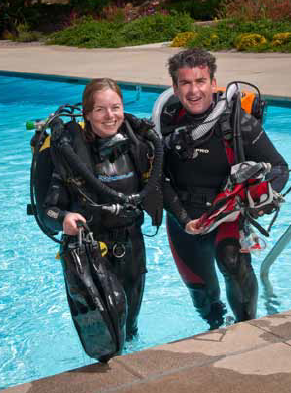 PADI Instructor Requirements – the PADI professional qualifications you need. Current diving medical clearance signed by a physician. Current rebreather instructor on the specific unit with a recognised organisation. 7. Course Materials – what do you need to prepare for the program? 8. Other requirements – Course Assist. This can be done before or after the instructor course or crossover. Crossover candidates who have taught a course through a recognised organisation may meet this requirement. Prior to certification as a PADI Rebreather Instructor, the candidate must assist with at least one PADI Rebreather Diver course or one PADI Advanced Rebreather Diver course.